Jason Wu took over the Office of the creative directors for the BOSS Woman line three years ago, it wasn’t easy: we connect finally especially well fitting men’s suits with BOSS – but Womenswear? Wu made the balancing act, and developed gradually the image of BOSS Woman: from clear, architectural, even an effort to masculine looks (on the basis of the suit Empire) until soft, cuddly, and especially feminine silhouettes. After six collections under Wu, must the woman line so no more hiding BOSS behind the posh second car of the Lords, but long stands for itself. That proved last Wednesday the summer collection runway show 2017: fit encountered distant body cuts, almost monochrome looks in red, blue and green fused into a colorful and hand-embroidered flowers and pleated, soft transparencies, sporty details and restrained cut-outs provided for a lot here and now and the perfect symbiosis of precession and lightness. The looks of models: clean, almost without make-up and suitable to the source of inspiration strictly backwards bound. Equal to two Make-Up artists concerned with parallel models like, for example, Sasha Pivovarova, Lui, MICA Arganaraz, and Binx Walton. Karlie Kloss and Toni Garrn. An explosion of color on the runway: not only the looks popped, wall lighting of hundreds, colored lamp shades also shone. Wu was inspired by the light of the former Whitney Museum (today met Breuer) and presented the models in front of a graphic wall with these lamp shades. The backdrop is considered a homage to Marcel Breuer’s architectural masterpiece. The darlings? The bright red slip dress with pleated details. The flower creations, especially the strapless dress. Tight like a swimsuit: thanks to pleated the rigor is taken. 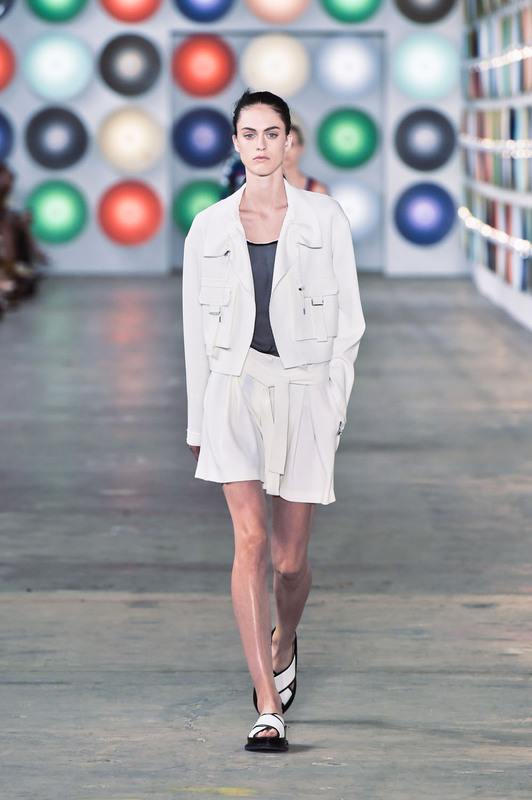 Jason Wu relies on athleticism – and BOSS is quite formidably. Merci, love novel, and the BOSS team, for there be may.